Roll Call returns to our now-regular venue in Cranfield, near Milton Keynes in 2019. Roll Call is your opportunity to play in a more themed tournament than at other BHGS events and also to compete for the Roll Call Shield team prize. 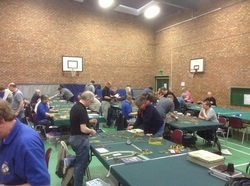 The venue capacity is around 150 players and so we will be amending the maximum number of players able to book into each period as bookings come in, in order to make sure that at least 6 places are kept open for entries to all periods. L'Art de la Guerre - 200 points, Feudal and Medieval lists, max 1 Elephant per list, all allies from these lists. Sharp Practice - a return outing for the popular 28mm Napoleonic skirmish game. 10 French and 10 Allied places are available. L'Art de la Guerre 15mm - 200 point competition The 1,400th Anniversary of the Sassanian Siege of Alexandria - Any army valid in 619 AD. ﻿All periods will be run in the traditional Swiss Chess format unless specified. In the event that there are insufficient players to make your chosen period viable (normally fewer than 6 players), you will be offered the option to switch to another period or a full refund. Late submission of army lists is your best and most effective way to make the lives of the many kind, selfless and generous people who organise these events for you a real misery. Please therefore try to submit your list in good time. Deadline dates and list checkers will be published on the BHGS website and communicated to players. The BHGS reserve the right to inflict any one of a wide range of as yet unspecified grave, horrible, humiliating and potentially personally painful penalties on anyone who submits a late list. Especially if you are a repeat offender. You know who you are.... so be careful ! As an entrant to one of our events you are agreeing to us processing your data as an attendee, and to receive from us a few emails containing practical details about the event itself. You will also be asked an "opt-in" question as to whether you wish to be included in the general BHGS email list, as per European GDPR regulations. We generally send out only a dozen or so emails each year to inform list members about upcoming gaming events. Information you provide when booking (i.e. which ruleset you enter) forms part of your profile, and means we can send you even fewer emails (i.e. we occasionally send emails promoting ruleset-specific competitions only to people who have played those sets at one of our previous events). You can unsubscribe or change your preferences for this list at any time via our website. If you are interested in running any other competitions or rulesets at our other events please contact us and we will try to accommodate you where we can. Given the range of periods we now stage, with different numbers of games, finish times and scoring systems it has proved rather difficult in practice to resurrect the Roll Call team competition in recent years. The historic and venerable "Hinchcliffe Trophy", aka the Roll Call Shield (which we found in a box during a recent archaeological dig, sorry, tidy up of one of the Committee's games rooms) will be awarded to this year's winners.